I’ve finally started to develop a taste for mustard although it’s taken me some decades to get there. The nasty neon yellow Plochman’s mustard of my childhood didn’t work well on my palate, especially after a disagreeably formative experience with a hotdog at the Lincoln Park Zoo in Chicago. I had bought an overload of mustard seeds in preparation for my Lime Pickle experiment (which is one of my absolute favorites on this site, BTW) so I thought I’d give making my own mustard a shot. I tried a side by side experiment with one being a success and the other what I would consider a failure. The successful one by far is the Kombucha fermented mustard. The failure was a cardamom mustard which I fermented with sauerkraut juice. The cardamom mustard simply ended up too bitter and distasteful, even after adding a bunch of sugar to try to balance it. It ended up in the compost bin. One is to toast the mustard seeds first. 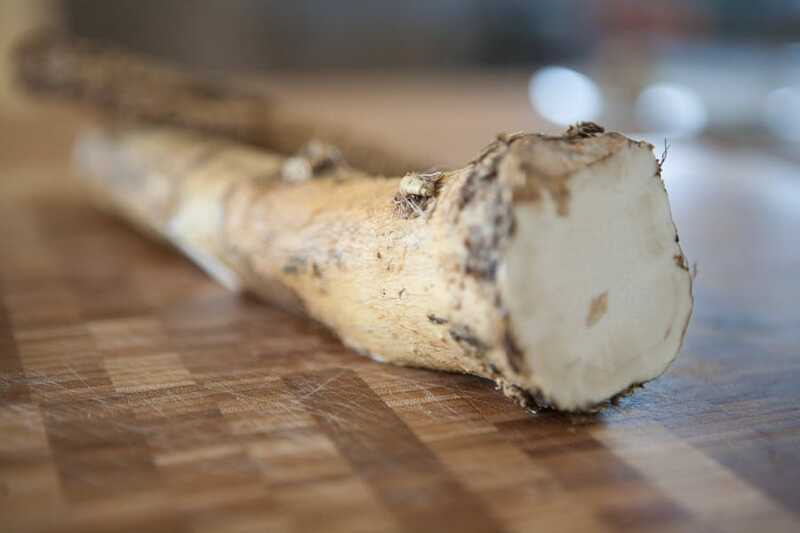 This can dramatically reduce the heat and add a nice flavor. You could also soak the seeds in some very hot water for about 5-10 minutes prior to making this recipe. That should help as well. place in a food processor or blender with th e salt and blend until it reaches a desired consistency. I chose somewhere shy of puree to retain some of the texture of the mustard seeds. My first tasting with this mustard was on an almond butter, avocado, sauerkraut sandwich and it was delicious. While flavorful, it didn’t dominate. Love it with veggie sausages too. Gotta get some pretzels and dip ’em in – my other favorite mustard foray. Enjoy. Thanks for your website. I have used many of the recipes on your site (and variations thereof) and they are all great. I wanted to share something with you I hope you enjoy. I didn’t know where to send it so I hope here is ok. Have a great day!! I love the cuisines of Thailand (Thai basil), South American countries (cilantro and parsley), and middle eastern countries (parsley) and noticed they all had a version of chimichurri. I combined all three and then fermented it for a wonderful tasting and healthy condiment that keeps for months in your fridge. I hope you like it. Roughly chop all the greens and all all the ingredients (not including the brine) in a food processor and finely chop. 2. Roughly chop all the greens and put all the ingredients (not including the brine) in a food processor and pulse until everything is finely chopped and well combined. 3. Place the mixture into a mason jar (I equip mine with an air lock) and pack the mixture in tightly. 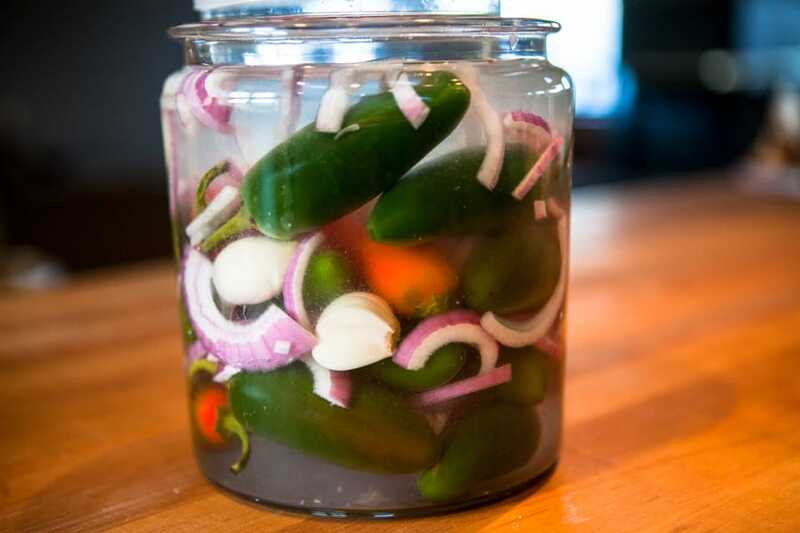 Make sure you don’t fill the jar too full. 4. Once the chimichurri is packed in tightly, gently pour 2-3 tablespoons of your brine (I used 19 grams of sea salt to 1 quart of water) over the top of the pesto. You just want enough to cover with a nice layer of brine. 5. Add your airlock, close the lid, and let ferment in a dark place for 3-4 days and then move to cold storage. 7. I have also used it like a pesto by adding grated parmesan cheese and olive oil to it. 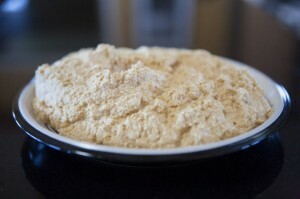 You can use it with with grilled chicken or steak, of course, but I also use it to flavor soups and sauces, add it to mayonnaise to make a sandwich spread, and use it together with siracha to make delicious deviled eggs. The best part is that it keeps in your fridge for at least three months (This is the longest I have ever kept it before eating it all so it probably lasts longer). After a month or so I pour a little olive oil over the top to keep it from browning, but even if you don’t do this you can just skim off the brown part and everything beneath is still wonderful. Peace y’all. Never stop thinking and living kindly!! Dumb question. 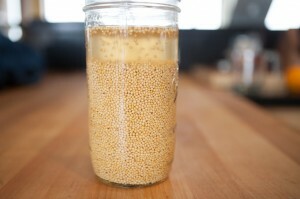 In the recipe, is it 1 and 1/2 cup of mustard seed or a 1/2 cup of mustard seed? Thanks Rick. No dumb questions in the fermenting world. 1 and 1/2. I’ve updated the recipe so the formatting of that is more clear. The kombucha mustard turned out great. I used brown mustard seed and had to add a bit more kombucha in the food processor, and a touch of tumeric. I’m trying this for the first time–one question, what if you used ground mustard? Would it work, and if so, how much by weight of mustard to kombucha? I’m a bit of an experimenter, but I haven’t tried this yet as I tend to prefer mustard to have a little more texture. I may get around to it, but I also encourage you to just play around and see what happens. If you give it a go, please let us know how it goes and what you learn. Thanks! I bought a tiny jar of McCormick mustard seeds and used my algebra to calculate the amount of kombucha vinegar and its in the cabinet now beginning its process. I’ll try it with some ground mustard and let you know how it goes! I had some success with my first tiny batch of Kombucha Mustard, but it was hotter than I like. Any clue how to mellow it out a bit? I added a little turmeric and heated it to stop the fermentation (hoping also that the heat would cool down the spicy-hotness–no luck) It does taste good, but I have to only use a tiny spread at a time, I’d really like it with less of a bite. Hi Cyn. The heat in mustard can be dependent on several things. I’ve updated the post to reflect this so please re-load the page and re-read. Now that you’ve made the mustard and it’s still too hot, I’d try adding a little honey or sugar as that seems to take the bite out of hot things. Sourness can sometimes help too so perhaps a little lime juice or vinegar. Good luck! I ended up adding a little hot water and blending it some more–still hot–but I put it in the back of the fridge and forgot about it for 6 months, then found it again and it was fine! No heat anymore, and just good mustard taste and texture. I am very excited to try this with my homemade sauerkraut! Can I use kombucha vinegar instead of the tea? I have quite a bit of vinegar right now. Thanks for sharing! Sorry, a bit confused. you want to use vinegar to make sauerkraut? Replacing tea? help! The mustard lasts a long time in the refrigerator. It’s never gone bad on me, but I ate always eaten mine within a year. Oh..no I meant that I could pair your mustard with my sauerkraut, like in your sauerkraut avocado sandwich. I was wondering if I could replace the kombucha tea in your mustard recipe with kombucha vinegar. Thank you!! I made it and it came out great! Thanks for the recipe. I used the really vinegary tasting kombucha from my scoby hotel, and I used 1 part Indian black mustard seeds to 3 parts yellow.,I stone -ground it and added a tsp of garlic to the mix. Yum! I love your site. and I put a link on curezone, where I am active on the water satng forum. And lime pickle is my favourite condiment, maybe of all time. 🙂 I will try your recipe, maybe next new moon. 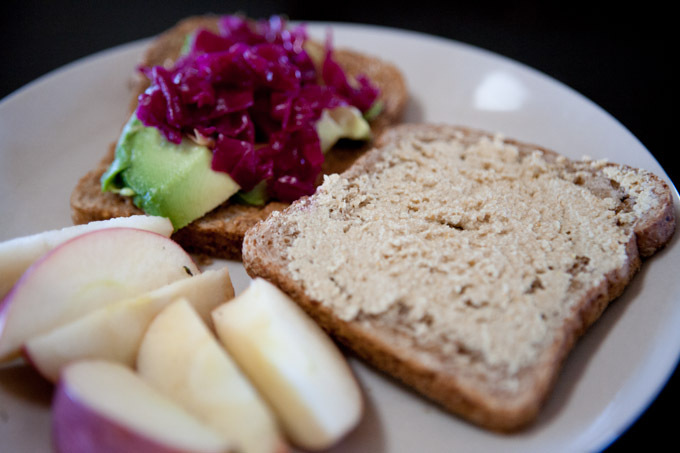 Second to that, I am pining for some dijon-esque cultured mustard, and was thinking, maybe kombucha. The best kombucha I’ve made so far, (going on five or six years) is one that sat out on the cold veranda, all winter, in a little styrofoam cooler, with no lid. A few of the bottles broke, but the survivors were better than champagne. I added ginger and apricots when I bottled them, and put corks in them. Didn’t know any better. And left them outside because we got tired of kombucha … long story short, the following summer, I opened a bottle, with a friend, and we drank the whole thing. So so good. I have a little discovery I can share with you, as exchange for you sharing all your lovely work. Avocado pit– I grated some yesterday. am experimenting with it. Let it dry on the cutting board. It’s quite good. A spicy flavour. I’ve used it before to due fibre, but just learned how good it is, and thought, well, what about adding it to kombucha, or veg. ferments? With the tannins, it’s probably good for pickles, or to keep turnip crunchy. (?) Third favourite cultured thing on my mind is the middle eastern turnips. . . .
correction: I meant to write water “fasting” forum. People who get into water fasting tend to be those who come around to the beauty of cultured foods. Thanks for sharing all of these recipes! Can’t wait to try this one. I’m confused about what to do with the sugar, though. Do you put it in at the beginning when you first put the seeds and the kombucha in the jar, or at the end, with the salt, when it goes in the food processor? Thanks! My apologies. I’ve adjusted the recipe to be more clear on that. Add the sugar with the kombucha and mustard seeds in the beginning. Good luck and happy fermenting! Thank you and please don’t apologize! I love your recipes and so appreciate your making them available to people AND answering questions about them! Trying your “Sivakraut” today–can’t wait. I don’t know why the computer is giving me an angry blue face–it isn’t offering me a choice that I can see… Please picture happy face instead. I still have a few days left but the mustard seed totally soaked up all the kombucha, is that normal? YOu can simply add some more kombucha to it if you like. You’ll have the ability to control the texture of the final product by how much liquid you add. Thank you for the idae!